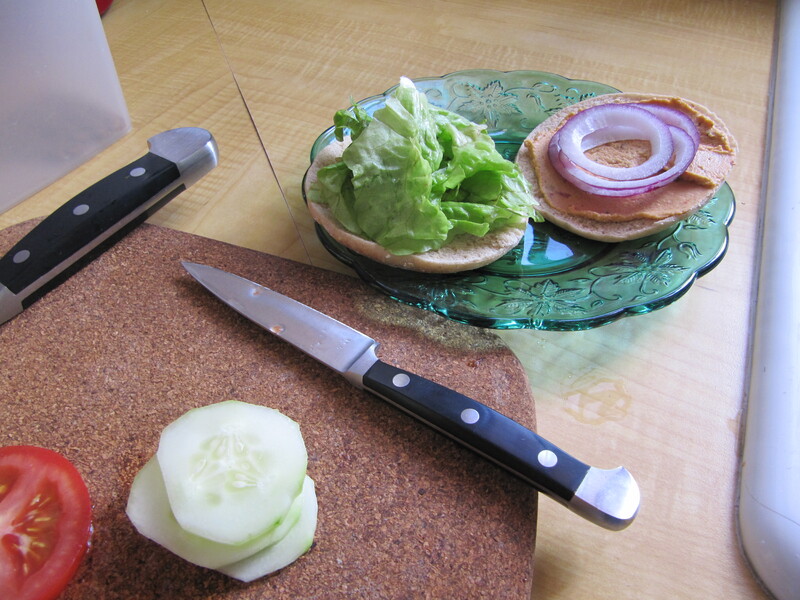 After a quickie fall inspired dinner I took to Thanksgiving preparations. Peeling yams for a sweet potato casserole. 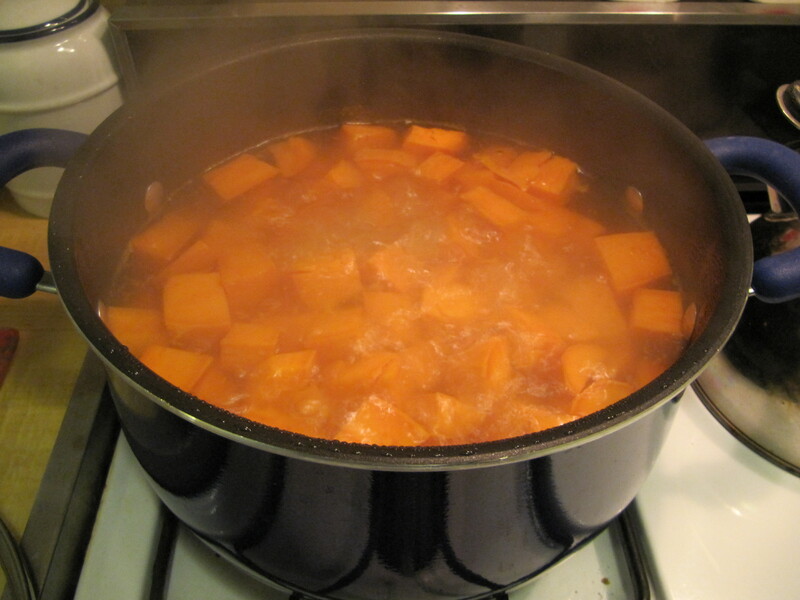 I know I should call it yam casserole, but I usually use yams instead of sweet potatoes in recipes. I like the darker sweeter flesh of yams, sweet potatoes always seem a little dry to me. 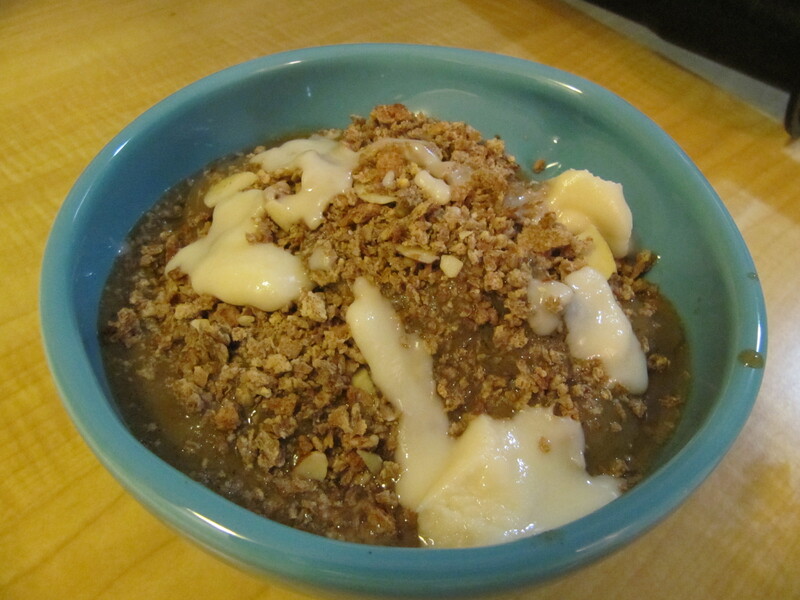 This year I’m trying Fat Free Vegan’s Sweet Potato Casserole with Pecan Topping. It’s very similar to the fat laden casserole that I’ve made in years past but with much less fat and calories. Good times. 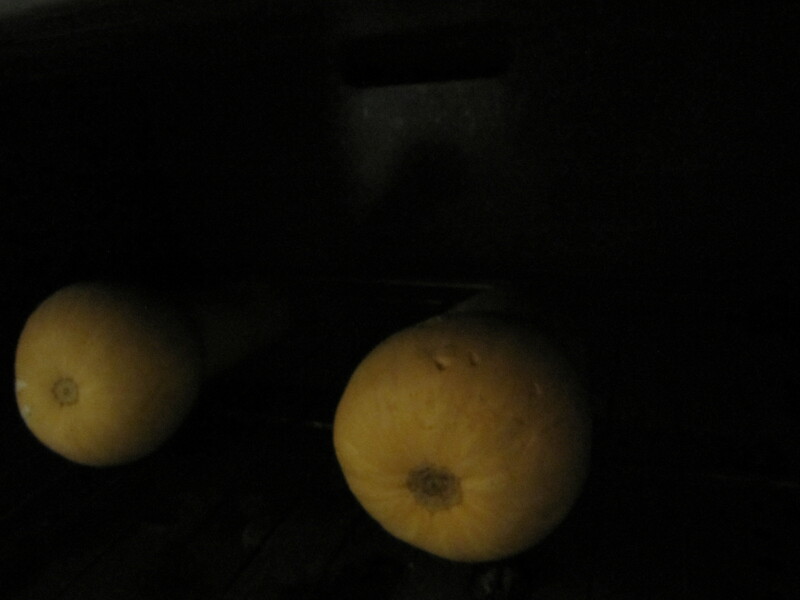 I also threw two butternut squash in the oven to roast for Autumn Harvest Salad. My house is a mess and I still have a ton of stuff to do but I’m not feeling too stressed about it. Maybe it was the calming influence my dinner had on me. 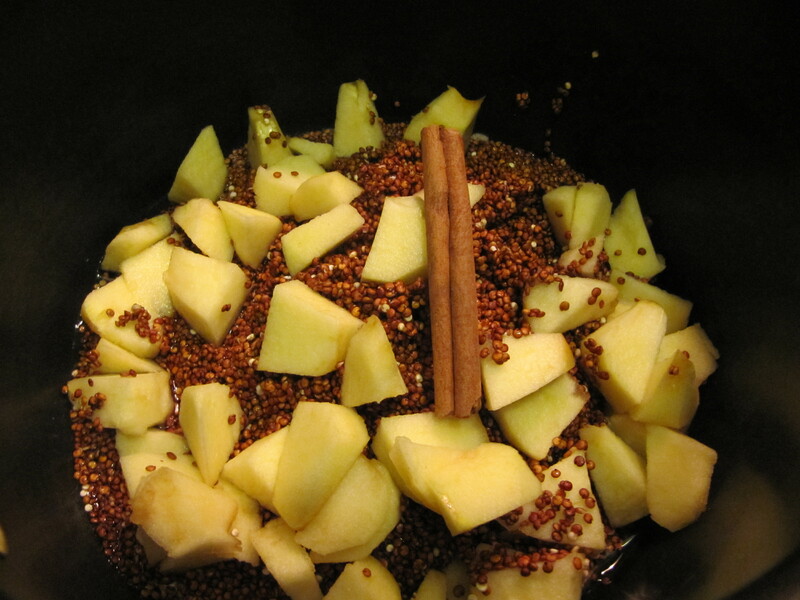 I made Apple Cinnamon Cranberry Quinoa courtesy of the darling Emily over at the Front Burner blog. 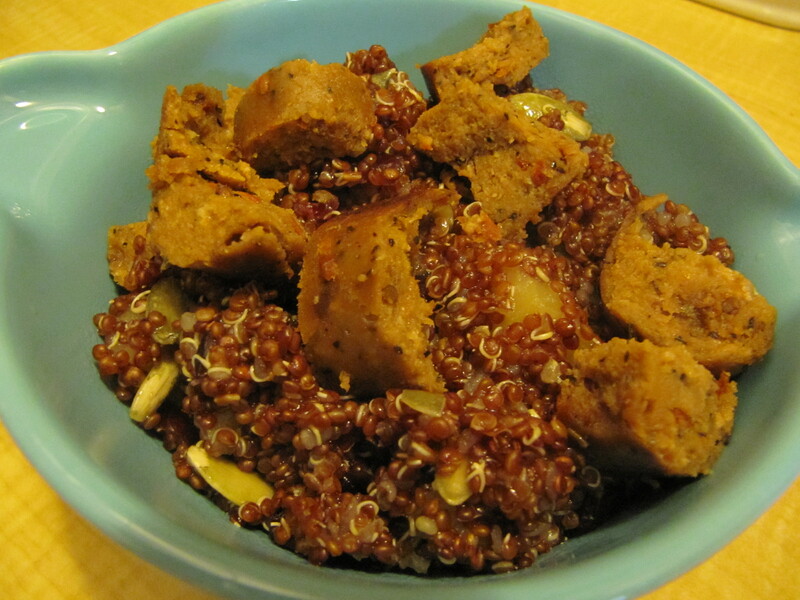 I topped mine with some Tofurkey sausage and the combination of savory and sweet put me in a zen frame of mind! Looks similar to my oatmeal ingredients yesterday…can’t beat a winning combination. But before you beet me up I have to say it is so nice to be home and cooking three meals in my own kitchen; well granted they weren’t all “cooked”, I should say putting together three squares! This morning my ankle was still kind of sore from the walk and rather than agravating a stress injury, I skipped the gym. That and the fact that I had a terrible nights sleep and had to be on a call at 6:00. Really not making excuses because I had really looked forward to getting back to the gym. Even though I said I was going to phase out the smoothie in a bowl thing, that’s what sounded good to me this morning so into the Vita Mix went some OJ, a scoop of Amazing Meal, frozen strawberries, mango, and banana; that all plopped into a bowl and got topped with a spoonful of Ezekiel Almond Cereal and another spoonful of Artisana Coconut Butter. Whew, was that ever good. It powered me out the door and I was in the office by six! 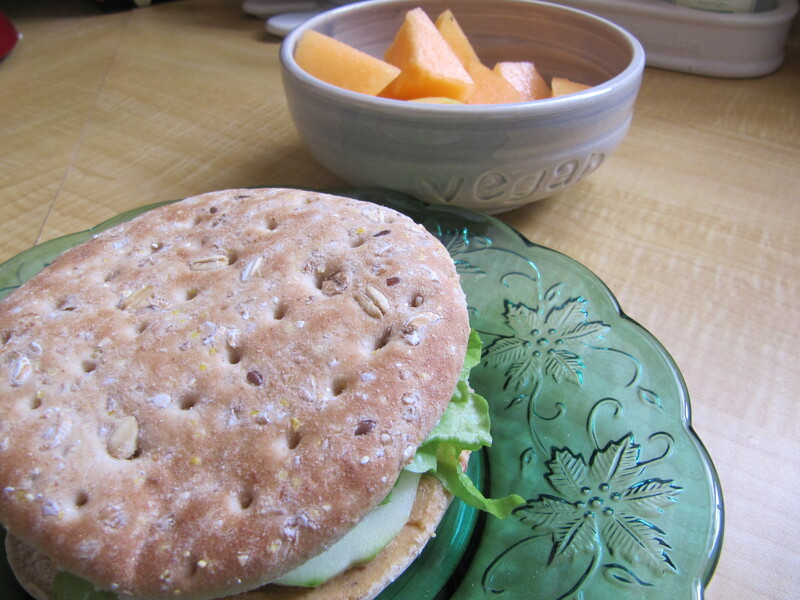 Lunch was a sandwich of Chipotle Hummus, cuke, tomato, and lettuce, on the side some cantaloupe from my last CSA shipment. Now we get down to the beeting. I am going to admit right off I’m not the biggest fan of beets so when I got three good size ones from Farm Fresh to You I wondered what I was going to do with them. During my meal planning I looked specifically for recipes to make sure I used up all my produce. Even though I compost I hate to throw stuff out. 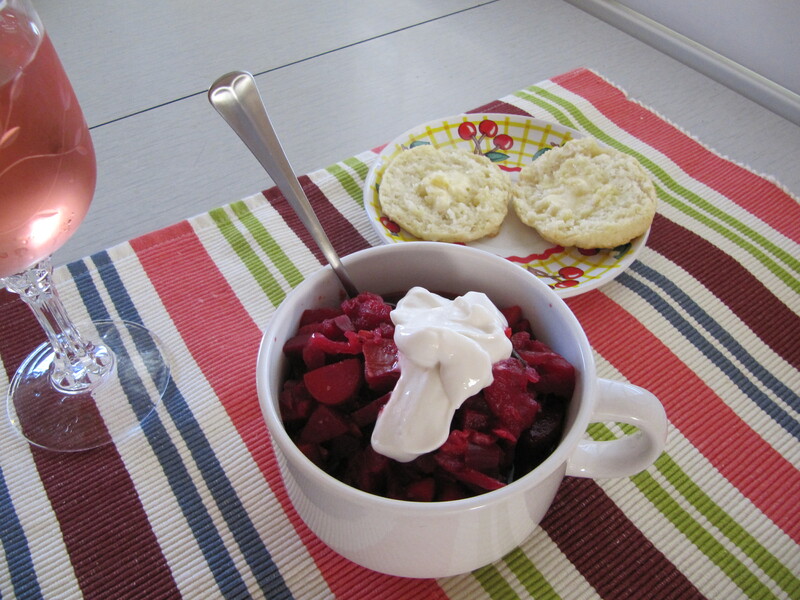 How it All Vegan had a recipe for Garden Vegetable Borscht which looked fully loaded with veggies including my beets…Duh, Borscht! 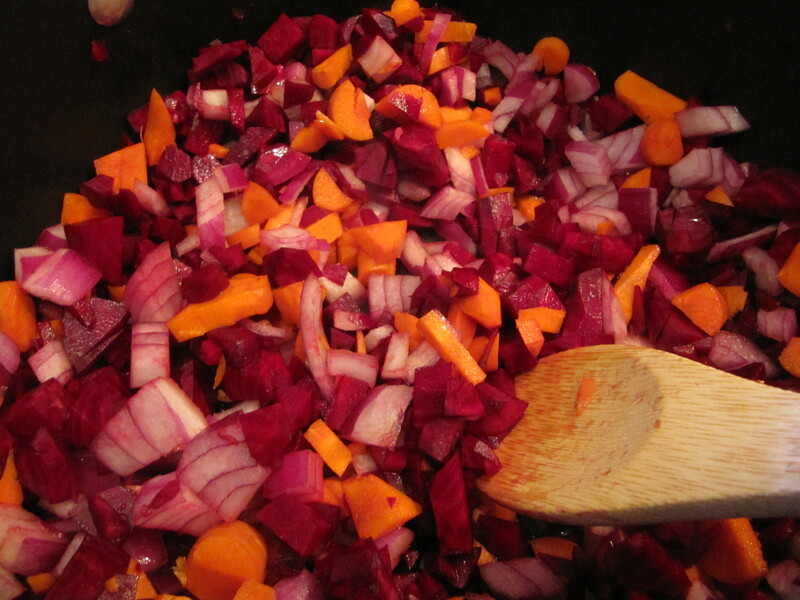 It certainly was colorful cooking up red, onion carrot, beets, garlic, tomatoes, spinach and cabbage. I had planned on some garlicky chard but with all those veggies I didn’t feel I needed anymore. It got topped with some Follow Your Heat vegan sour cream with fresh-baked biscuits from the same cookbook on the side. This stuff was seriously good and filling. The soup was only seasoned with pepper and a spoonful of horseradish but that was just enough. the veggies were firm and the broth thick. It may actually go on my repeat list. And even though N. ate two big bowls of it, there is enough left over for lunch tomorrow! Happy Birthday Mom and Dad. I was in charge of bringing the cake to the family get together this afternoon and didn’t have a clue what I was going to bake. 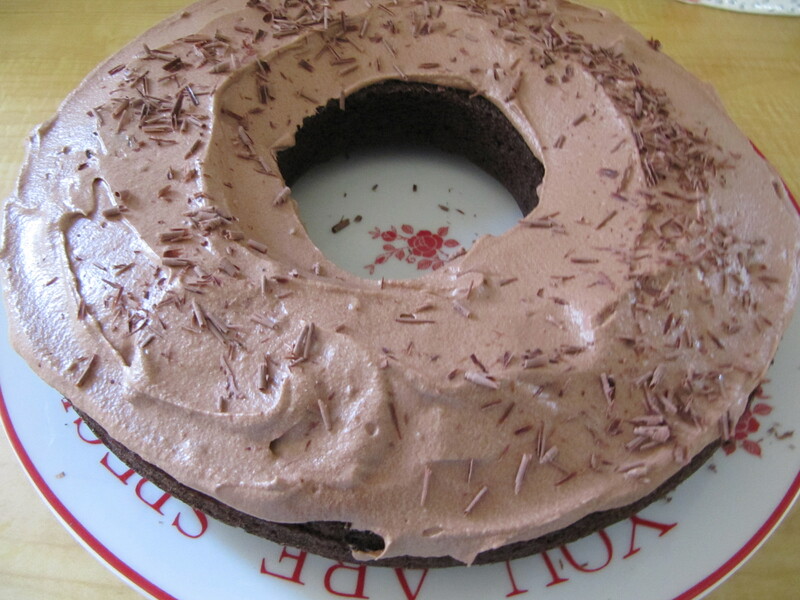 I perused The Joy of Vegan Baking for inspiration and settled on the chocolate cake with chocolate frosting. Mainly because my family loves chocolate and I had all the ingredients without having to make a grocery run. I pulled out my springform pan which I believe I haven’t used in the last 10 years but still hang on to for just such occasions as these. I mixed everything up and dipped my finger in the batter before pouring it into the pan and thank goodness I did; I had forgotten to add the sugar! So I dumped in the sugar, remixed and panned it then into the oven it went. 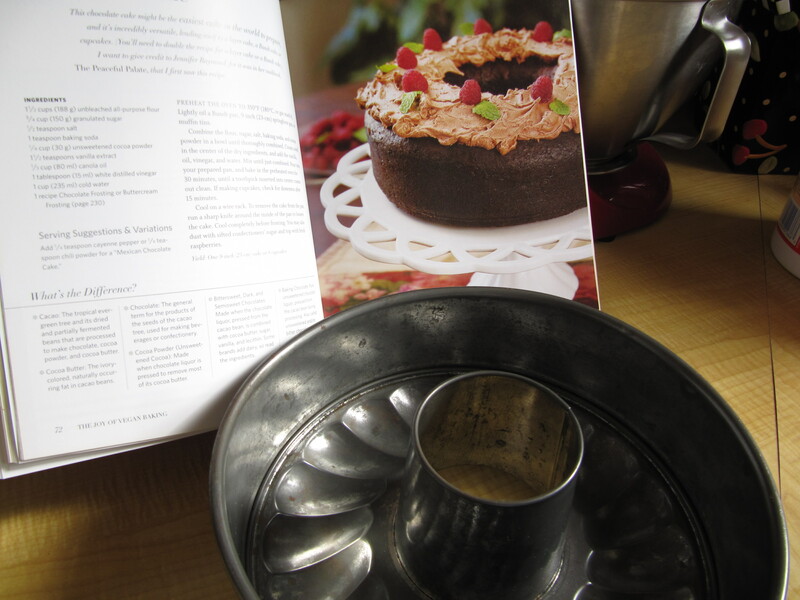 Thirty minutes late I was pulling out a delicious smelling but barely risen chocolate cake. When I unpanned it it resembled a chocolate donut. Disappointed but running out of time I whipped up the chocolate frosting and piled it on. I had a dark chocolate bar in the fridge so I grated a bit on top because it was looking a little pathetic. When all was said and done I had a giant chocolate sprinkle donate for the birthday festivities. I don’t know if people felt sorry for me or what but there wasn’t a crumb left at the end of the day. I don’t know if it was the sugar add in or just the general characteristics of that cake that made it so flat but I’ll try it again and hopefully remember to add everything at the beginning. I skipped the cake because of the detoxing thing, I didn’t think sugar was the best thing to eat during a detox. So busy showing off my sifting skills that I forgot the sugar. 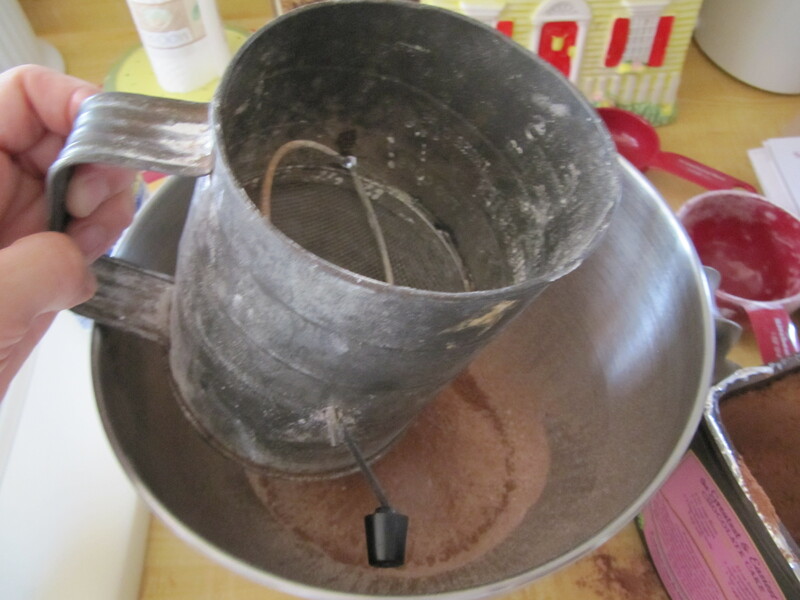 Kind of like trying to make hot chocolate with unsweetened cocoa powder. Ever do that as a kid? The giant donut…on the “You Are Special Today” plate that I break out for such occasions. 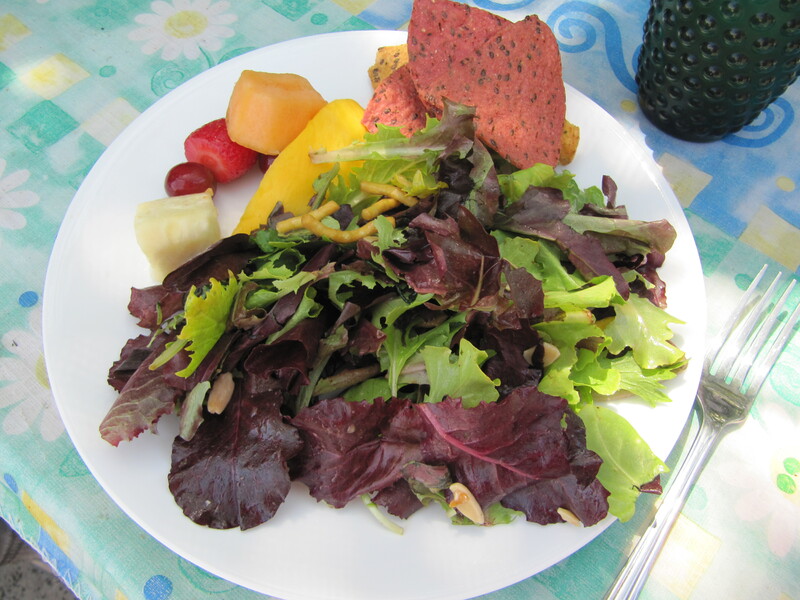 Detox lunch…Chinese Chicken salad sans chicken; fruit, and TJ’s flax chips. Yes I know the chips really aren’t detox but I needed a little salty crunch with my meal. Don’t judge, this is my detox!